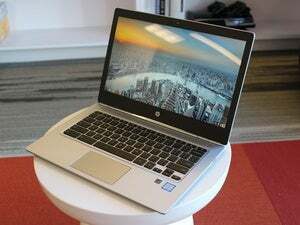 This is a Chromebook solid enough for business use. The Dell Chromebook 13 introduces a new adjective to its ecosystem: classy. Specifically, it fulfills a longstanding need for a professional-grade machine that’s portable, productive, and built with high-quality materials. 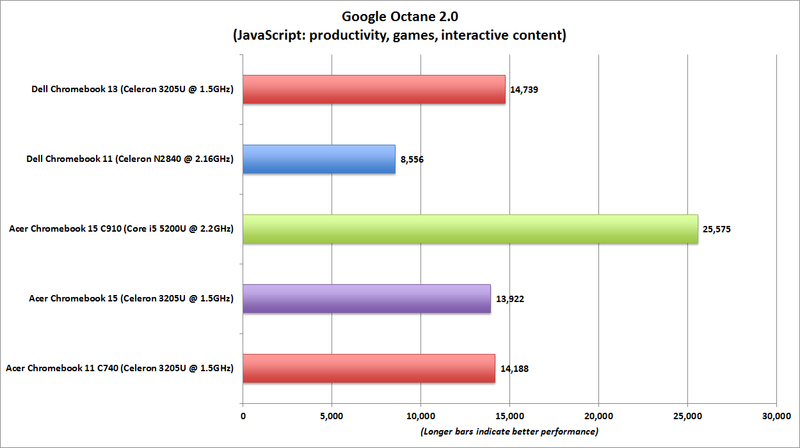 Up to now, no Chromebook had stepped up to meet those demands. The majority of 11-inch models have mediocre build quality, and that screen size is too small for all-day work. On the other end of the scale are the few 14- and 15-inch models, which can be too heavy. Google’s Chromebook Pixel is amazing in all respects, but its price ($999 and up) simply lies beyond most budgets. The Chromebook 13 nails all the business requirements with a starting price of just $429 MSRP (available through Dell), topping out at $649 for fancier configurations. It also boasts impressively long battery life, and everyone likes that. Carbon fiber makes the Dell Chromebook 13’s lid tougher than a typical consumer model’s. 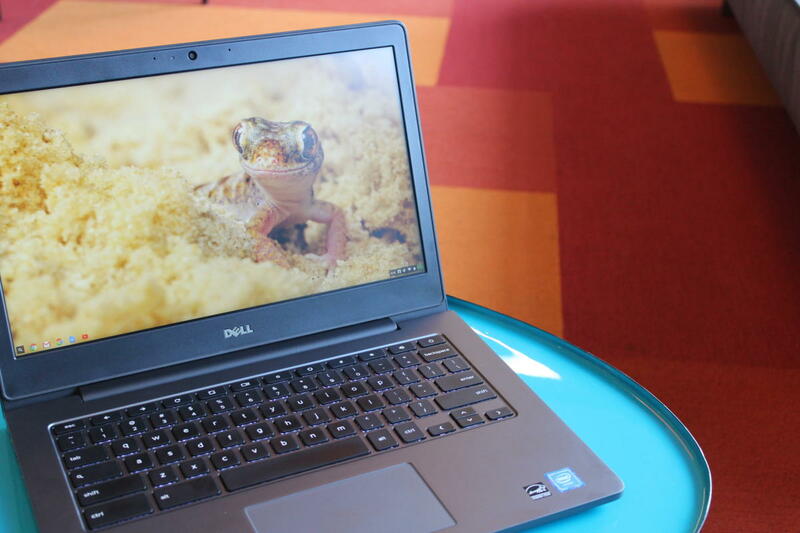 The Dell Chromebook’s features set it apart from most other Chromebooks. Let’s start with the case. Its lid is made of resilient carbon fiber, with a substantial rubber gasket running along the top. The body is a combination of magnesium alloy on the keyboard tray and aluminum underneath. I’m not saying you should drop this Chromebook, but if you did, this tough shell would hold up better than your run-of-the-mill consumer model’s. Our test unit, which is the base model, comes with a 16GB SSD. Other models offer 32GB of storage. The standard 13.3-inch Full HD display (1920x1080) has good image quality, though its anti-glare coating can make colors look a little dull. Step up in price to the Full HD touchscreen, which we didn’t test, and you should expect a brighter (if more reflective) image, plus Corning Gorilla Glass for extra durability. 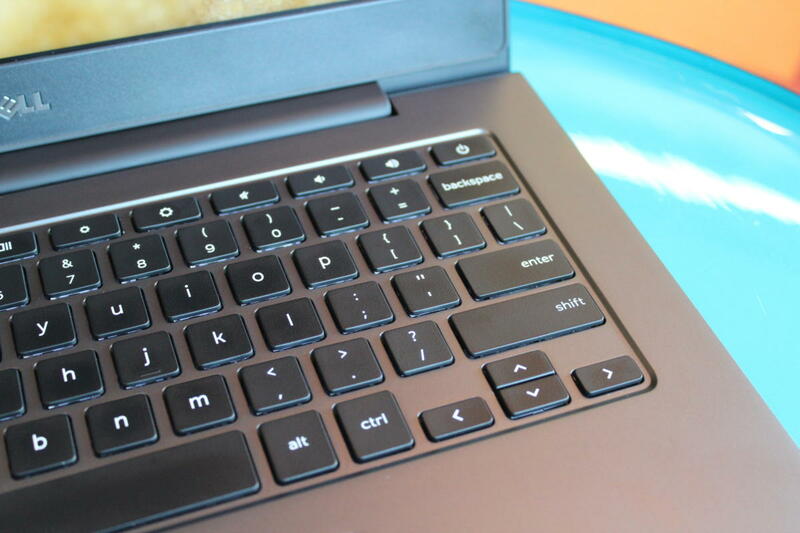 On the Dell Chromebook 13, the keyboard’s cursor buttons and top-row function buttons are half-height, but chiclet spacing makes them pretty easy to press. 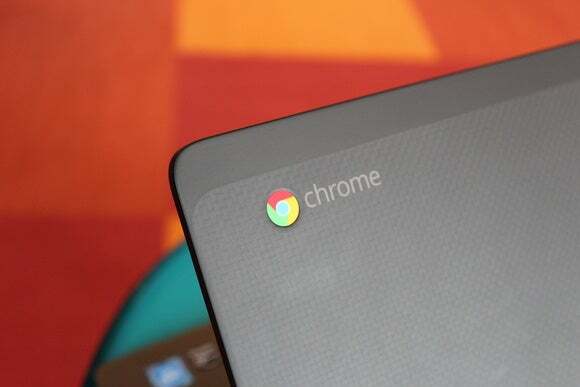 The typical consumer Chromebook’s input devices can be awful, with clackety, hard-plastic keys and twitchy touchpads. The Chromebook 13 improves upon the norm yet again with a chiclet-style, backlit keyboard that feels firm instead of harsh. The glass touchpad is large and responsive. The audio/video array is typical and unremarkable. You get a 720p webcam, dual microphones, and dual two-watt speakers. 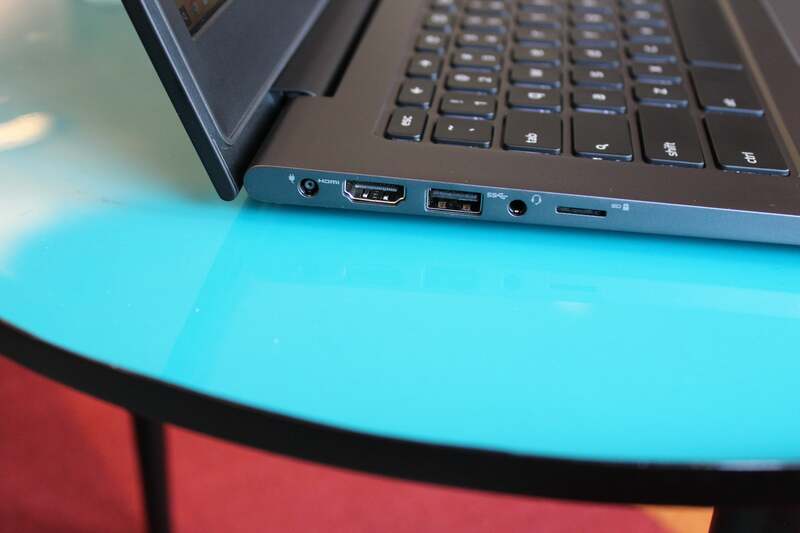 The left side of Dell’s Chromebook 13 has power, HDMI 1.4, USB 3.0, headphone, and microSD card ports. slots. Networking means everything on a Chromebook, and the Dell Chromebook 13 is well-equipped. It comes with an Intel Dual-Band Wireless-AC 7260 card, which features an 802.11ac Wi-Fi antenna and Bluetooth 4.0 connectivity. Like any skinny laptop, though, the Dell Chromebook falls short on ports. It has just one each of USB 2.0 and USB 3.0 ports, plus an HDMI 1.4 port. The microSD slot might have been all that could fit in the slim profile, but it’s less common than an SD slot for taking extra storage. You also get a lock slot, plus a combo jack for headphones or microphone. 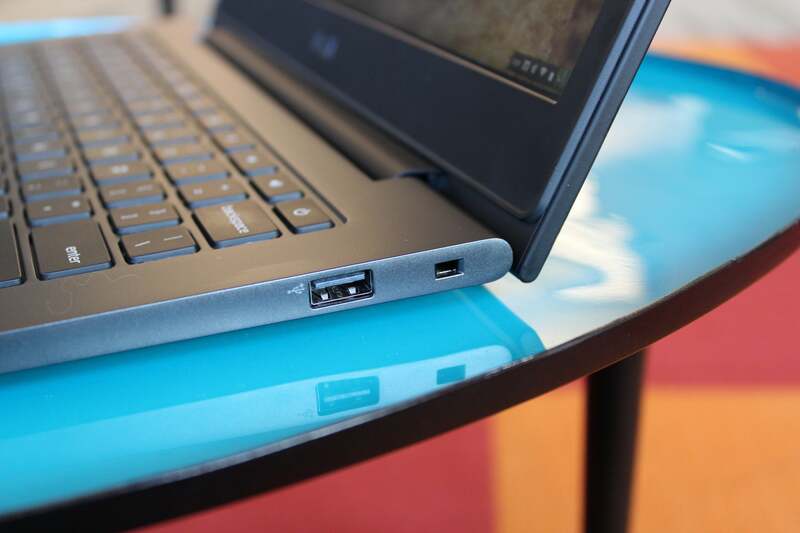 There’s no USB-C, but that’s still a pretty new port. I would be disappointed not to see it on the next iteration of this laptop, though. The right side houses a USB 2.0 port and a Noble lock slot. The Dell Chromebook 13 performed noticeably better than its peers, though its setup is nothing special. (We have a guess as to why.) Inside is an Intel Celeron 3205U processor (Broadwell) running at 1.5GHz, with 4GB of DDR3L RAM and integrated Intel HD graphics. We compared it to other Chromebooks with the same CPU and memory amount—the Acer Chromebook C740 and an older Acer Chromebook 15. We also threw in the Acer Chromebook 15 C910, a Chromebook designed for gaming that sports a Core i5-5200U CPU (also Broadwell) and 4GB of RAM. On the other end of the performance spectrum, we added the Dell Chromebook 11, which sports an older Intel Celeron N2840 (Bay Trail) chip we’ve tested in Chromebooks. In test after test, the Dell Chromebook 13 outpaced its similarly configured rivals, though not always by much. 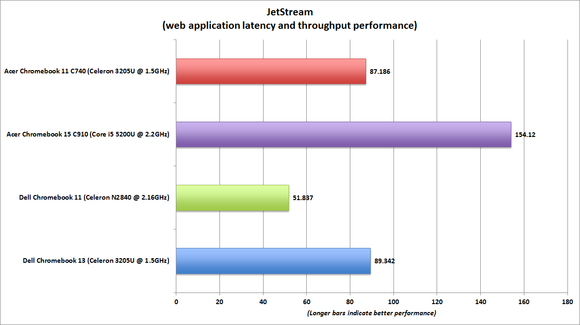 Given that the configurations are the same, the only other difference lies in the Chrome OS version when tested. Google updates its OS frequently, and we update test Chromebooks to the latest OS before we test it. While the Chromebook 13 was tested using OS version 46.0.2490.82, all the other systems in the chart were running older versions of Chrome: 41.0.2272.102 (64-bit) for the older Acer Chromebook 15, and 44.0.2403.125 (64-bit) for the rest. 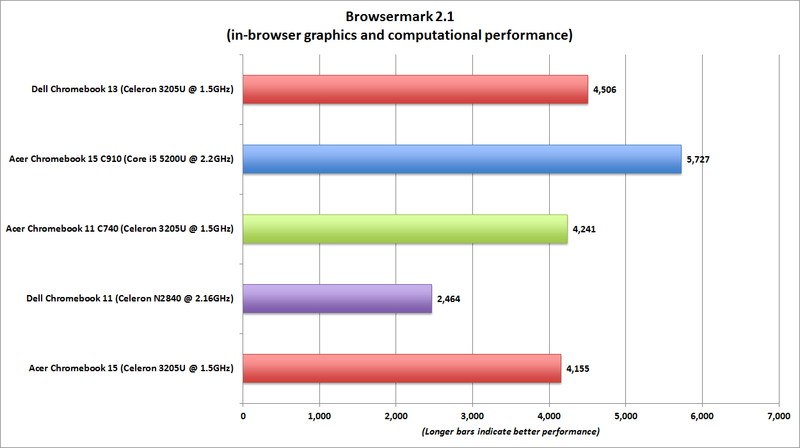 Browsermark 2.1, for instance, gets right to the heart of the Chromebook’s operating system, measuring graphics and computational performance within the browser. The Acer Chromebook 15 C910 handily outpaced everyone else, but Dell’s Chromebook 13 was the fastest among the rest by a few percentage points. 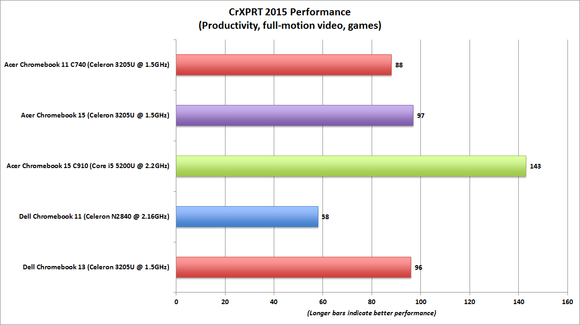 The cr-XPRT performance test measures Chromebook performance in basic productivity tasks as well as more demanding activities, such as watching movies or playing games. 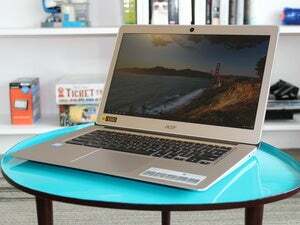 The Dell ran neck-and-neck with the older Acer Chromebook 15, while the newer and higher-end Acer Chromebook 15 C910 skated away with the prize. The Chromebook 13 shone brightest in battery life, using cr-XPRT 2015’s expected battery life projection. Here, the tables were turned: The Acer Chromebook 15 C910 posted the shortest life of just over 7 hours, due to its power-hungry Core i5 processor. 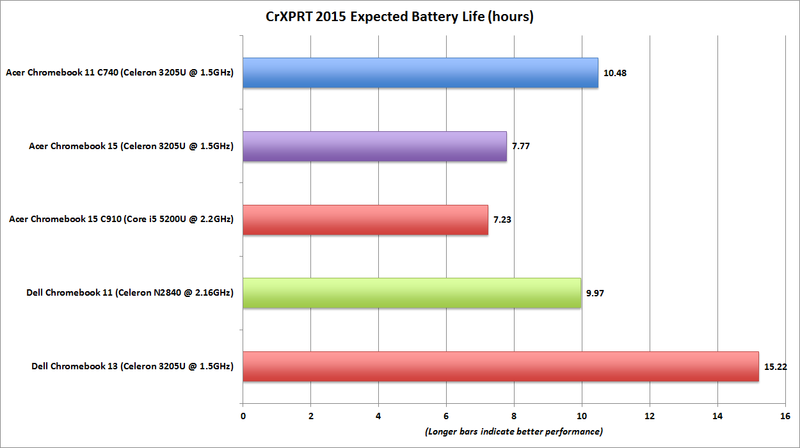 Dell’s Chromebook 13, with a less demanding processor and a large 6-cell, 67WHr battery, outpaced everyone by a wide margin: At 15 hours and change, it lasted 50% longer than the next-best Chromebook on this test. The Dell Chromebook 13 is affordable quality in the Chromebook space. It’s sturdily built, well-configured, and its performance is competent, while its battery life is outstanding. You wouldn’t buy this for your kids, but for professionals and Chromebook aficionados, it’s currently the strongest buy. The Dell Chromebook 13's carbon-fiber shell and extra-long battery life fulfill a longstanding need for a professional-grade machine that’s portable, productive, and built with high-quality materials. For professionals and Chromebook aficionados, it’s a great buy.